Bob Mankoff’s two-decade reign as cartoon editor of The New Yorker is coming to a close in May, when he is stepping down from his position to become a contributing artist, a move editor David Remnick punningly called “going back to the drawing board” in a note to staff. Remnick also acknowledges Mankoff’s work on cartooning’s digital frontier, writing that Mankoff “has found myriad new ways to publish cartoons and promote the form.” Mankoff started the Cartoon Bank, a repository for preserving and selling cartoons from The New Yorker and elsewhere, in humble surroundings (his home) in 1991. The New Yorker later purchased the Cartoon Bank in 1997. The next cartoon editor, Emma Allen, will continue Mankoff’s work on the digital front, focusing, in part, on “creating a bigger digital footprint for cartoons,” per Remnick. “I am quite sure that we have only just begun to figure out new ways to explore and exploit digital technologies as a way to distribute cartoons to more and new readers,” he writes. Allen is an internal hire, an editor of the magazine’s Talk of the Town section. “Emma has a terrific eye for talent, knows the history of cartooning deeply, and is an immensely energetic and intelligent and sympathetic editor,” Remnick writes. 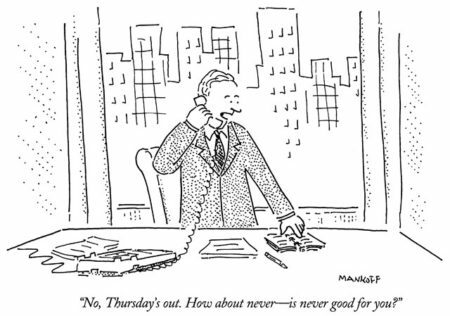 While a new cartoon editor rises, there will still be editing work in Mankoff’s future; he’ll be the editor of a new cartoon tome called The New Yorker Encyclopedia of Cartoons.